This past week, the Museum of Early Southern Decorative Arts (MESDA) celebrated the 50th anniversary of its founding in historic Old Salem in Winston-Salem, NC and AV Connections, Inc. was on hand to provide sound system rentals in NC for the gala and auction evening. One of the finest American museums on the subject of decorative arts, MESDA joined forces with Graylyn Conference Center - a quintessential example of the building-construction decorative arts in its own right - to host this lovely evening banquet for MESDA donors and sponsors. With 280 guests expected, the size of the expected attendance greatly surpassed the number of people who could fit into Graylyn's historic Atlantis Room. AV Connections, Inc. was charged with assembling the AV in the Atlantis Room and broadcasting it to the terrace lawn outdoors. The Atlantis Room was important to the evening all on its own, as a prime example of Southern decorative arts. Hand painted to recreate an under the-scape, it is was a fitting place in which to note the accomplishments and growth of MESDA in its first fifty years and to plan for its future. Turning fifty is a huge accomplishment for MESDA and its endowment which has been serving the growth of the Museum since 1960. Five years of planning preceded the opening of the Museum in 1965 by local antiquities dealers Frank Horton and his mother Theodosia Taliaferro. Seeing a void in both respect for, and preservation of, Southern decorative arts they endeavored for five years to fund the future museum endowment. 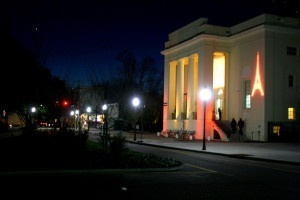 With the support of the arts and collecting communities locally and throughout the South, the Museum sprung to life. MESDA continues to increase its collection and educational offerings and can be credited with bringing recognition to generations of Southern crafts-people. In the permanent collection of MESDA an impressive array of decorative examples thrive under watchful eyes of dedicated cultural arts preservationists, including some of the South's finest works of furniture making, wood work, painting, and inlay design construction. And while this effort is celebrating fifty years, that is a relative youngster in the realm of museums preserving cultural arts. Creating healthy endowments and robust fundraising efforts are the key to museum survival and growing collections and offerings. 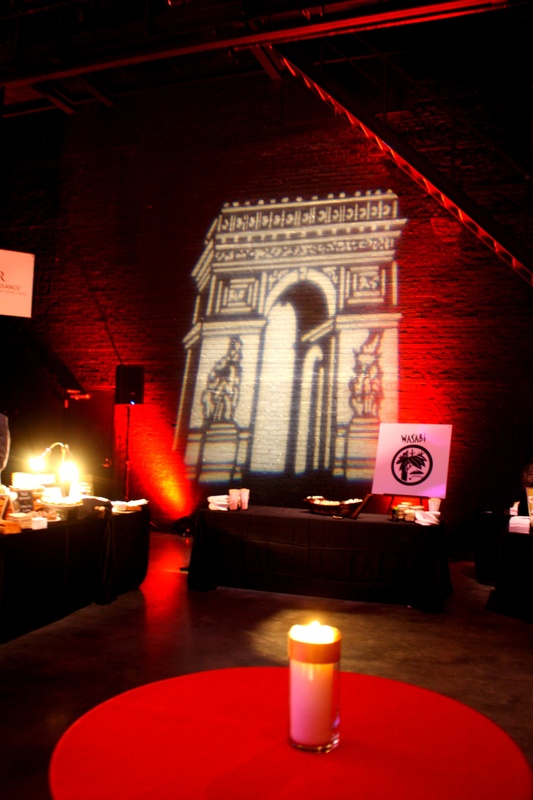 This gala and auction evening was a resounding success, raising $212,000 for MESDA. As natives of the South, we could not be happier to report this was the case. AV Connections, Inc. was pleased to provide two elevated screens with bright projectors and a sound system that extended outside into the soaring courtyard so those who could not be accommodated in the historic Atlantis Room were still a part of the event via the outdoor courtyard’s overflow space. 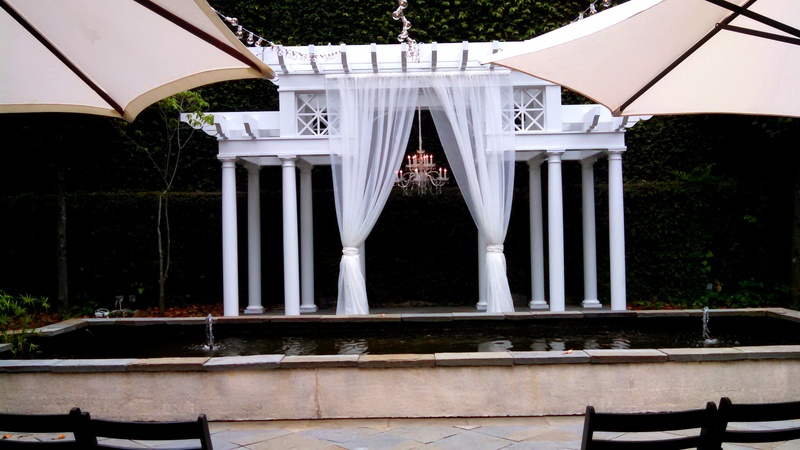 Doesn't this gala look fantastic; we were thrilled to provide audio rentals in Winston Salem, NC for this recent affair at the legendary Reynolda House Museum and Gardens. One of the finest historic sites in this part of North Carolina in which our corporate headquarters resides and where we were founded, the Reynolda House, is a tribute to the great builders and landscapers of the Guilded Age. Preserved largely through the efforts of events like these held yearly by the Reynolda House Foundation, one of the great eras in American structural history is stewarded and protected. Once the home of Richard Joshua Reynolds (founder of RJ Reynolds, the local tobacco concern) and his wife, the Reynolda House was inherited by a daughter who first held the home as a vacation home and later took up residence full time. Loving the house as her decendents did, they undertook - under the guidance of granddaughter Barbara Babcock Millhouse - to create a foundation for the lasting preservation of the home and site, and the Reynolda House Foundation was born. The site, largely still intact as originally constructed and completed in 1917 became a public museum in 1967. A viewing museum which now houses extraordinary works by American artists was additionally built on the grounds. The permanent collection houses some of the nation's finest works of art by preeminent hands. Revolving visiting collections are also part of the work of the museum. Regular visits to the collection will make you well versed in the great works of our national artists; once a year is not enough. 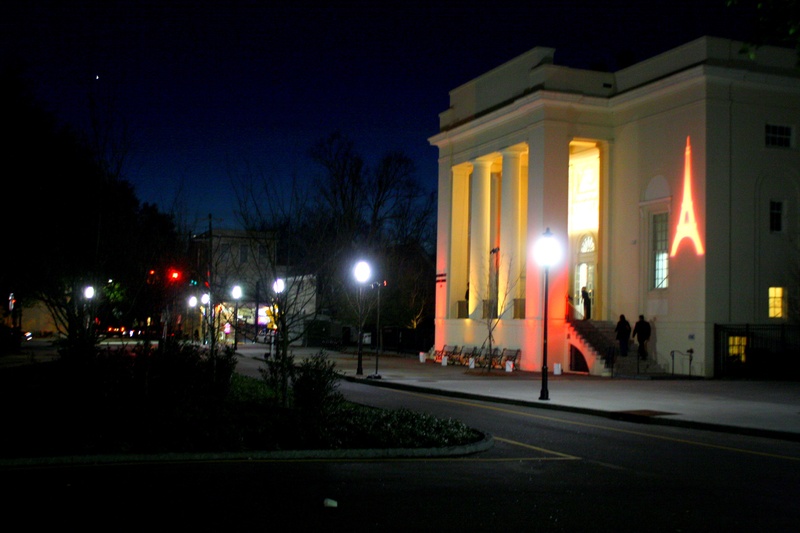 The gala you see here supports the efforts of the House to both sustain the house and landscape formal and informal gardens and to continue to broaden the museum collection and add revolving exhibits. 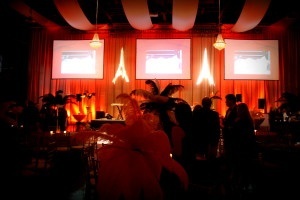 AV Connections, Inc. was pleased to provide audio rentals for this years gala. On August 20, AV Connections, Inc. provided banquet dinner AV rentals for the The Salvation Army Boys & Girls Club Dinner. 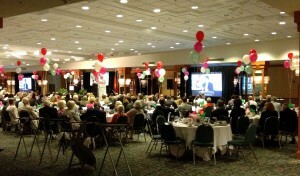 This gala banquet was held in the Grand Pavilion of the Embassy Suites in downtown Winston Salem, NC. The gala's key note speaker was Tony Thompson, President and CEO of local Fortune 1000 corporation, Krispy Kreme Doughnuts. Bring 25 years of management experience to bear, Mr. Thompson took to our microphones to support the Salvation Army's local and national missions and goals. An ardent supporter of the Boys and Girls Clubs, Mr Thompson's remarks were well received by banquet guests. Krispy Kreme Corporation continues to me a major supporter of local charities, the Salvation Army among them. Tony Thompson joined Krispy Kreme Corporation after distinguishing himself in the management teams of Papa Johns, Scotts, Con Agra, and Coca-Cola Bottling Company. Winston-Salem was pleased to welcome him to Krispy Kreme, a heritage local corporate business of resounding success. 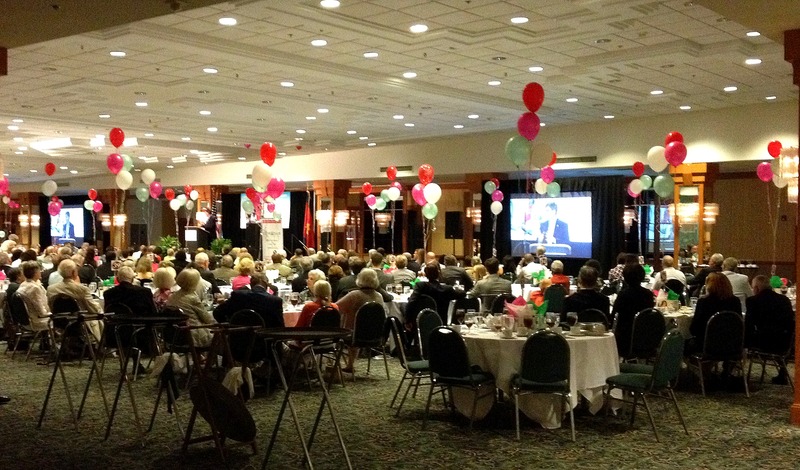 For this event, AV Connections, Inc. worked in partnership with Mr. Bill’s Productions to provide two large fast fold projection screens, two projectors, and a switcher to switch between a camera taping of the event and a laptop feed for a feature video presented to the guests. Outdoor lighting rentals NC from AV Connections, Inc.
We love a challenge, call us for outdoor lighting rentals NC to create something remarkable on the grounds of your evening event. In your planning, consider that the light on the grounds of a historic estate for your gala, banquet, or wedding is a critical to the atmosphere as the tablesettings and decor. 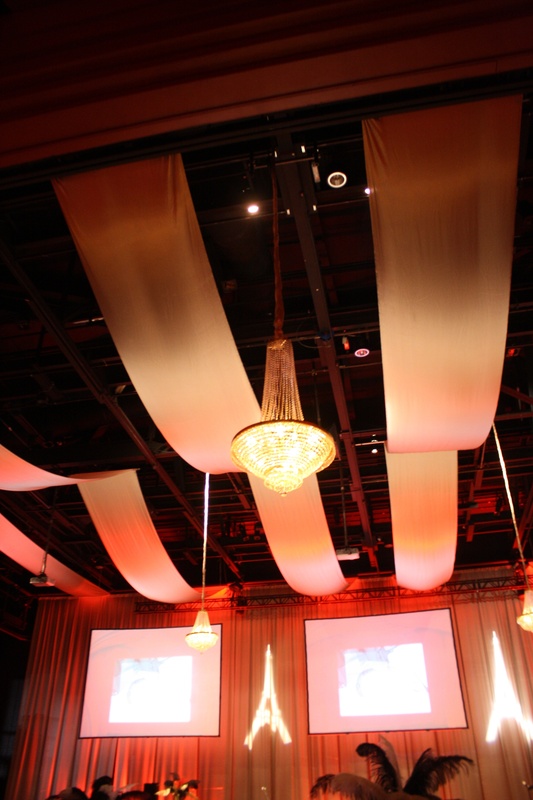 AV Connections, Inc. Is fully equipped in North and South Carolina with extraordinary chandeliers, cafe bulb lighting, and customizeable lighting options. We are happy to attend location walk-throughs with you to plan your events. If you have inspiration - Pinterest photos, magazine pieces, of personal photos - you'd like us to begin with, bring them with you and we will talk them through in terms of functionality and your budget. 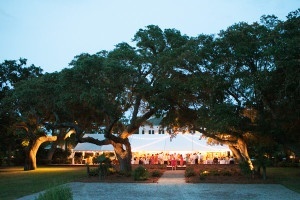 AV Connections, Inc. has worked in most of the Carolina's extraordinary venues and we are comfortable discussing most locations over the phone if you are planning your event from a distance. Starting early gives both you and our event lighting team time to develop the best custom lighting design available for your site. Give us a call and flip through our Pinterest lighting page and let's create something incredible and memorable together. Our North Carolina lighting rentals change the face of an event or party. While lighting is critical at night for any type of gathering, it is not to be underestimated at any time of day. 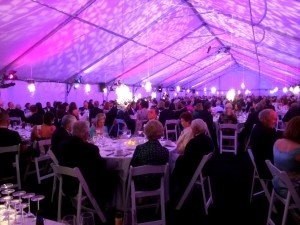 Many North Carolina lighting rentals clients use strings of cafe bulb lighting or indoor colored-gel uplighting to define the perimeters of an event space or to add a festive atmosphere indoors. At this beach-side wedding, the couple's vows were said toward the dusk time of day. 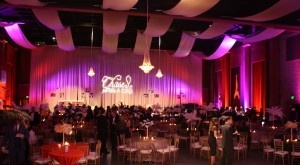 For that event we were happy to provide audiovisual rentals for their guests to best hear and witness their vows. 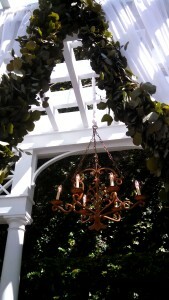 When the reception moved to the house, it was still day light. 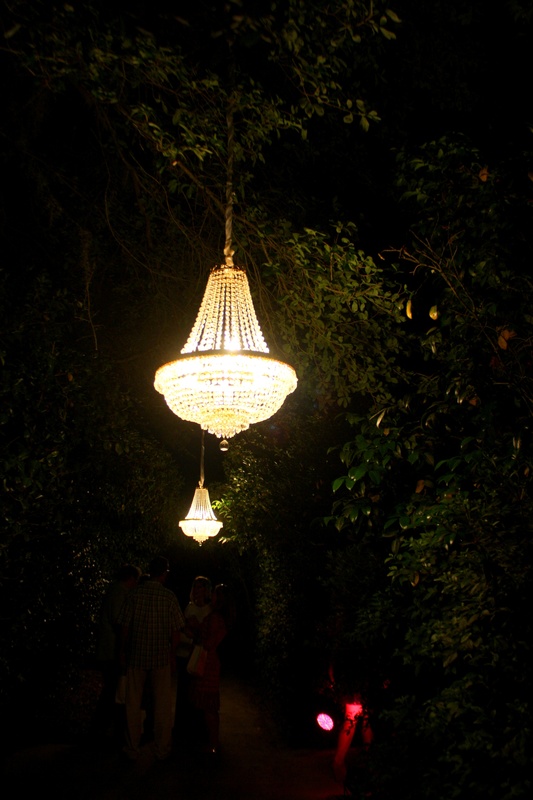 But, the lighting design helped to create a party atmosphere while the sun was still up and turn it into a twinkling fete by nightfall. Our North Carolina lighting rentals designers are always pleased to create an individual and site-appropriate lighting design for your conference, meeting, or event. Let's be in touch today. 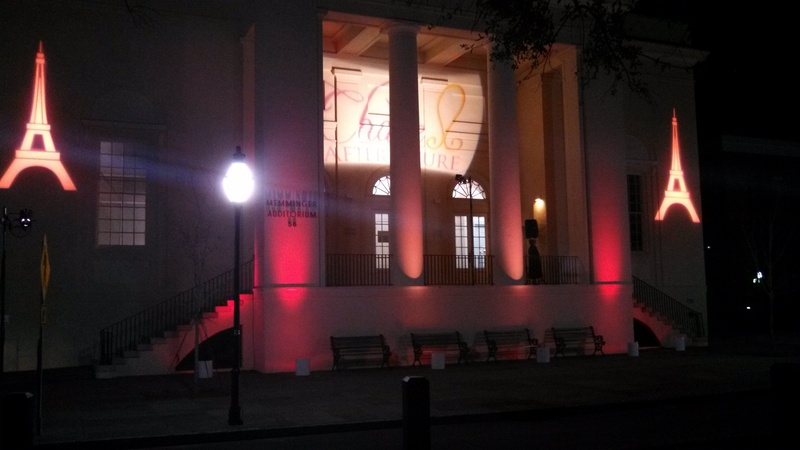 AV Connections, Inc was pleased to support our Charleston branch this past month to assist with gala lighting rentals for the 2015 Chase After a Cure Gala at the Memminger Auditorium in downtown Charleston, SC. 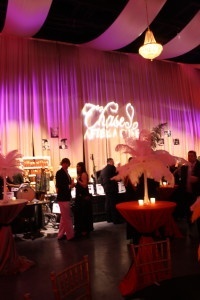 In January of each year for the past seven years, the Chase After a Cure Foundation creates a gala event for 400 people. For the past two years the event has been held at the Memminger. The theme for 2015 was AN Evening in Paris. 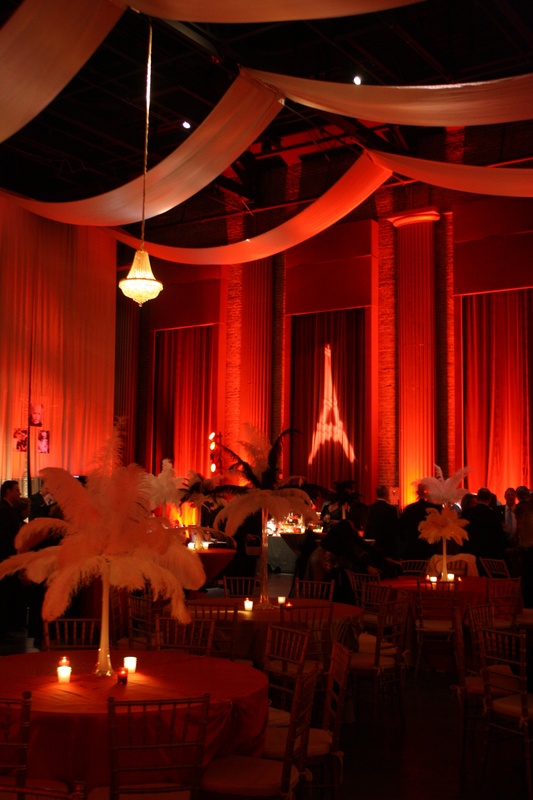 Our Charleston office took the Evening in Paris theme and ran with it. We could not be more proud of the resulting event. 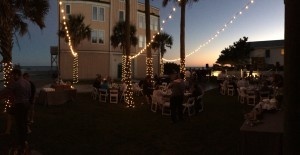 The gala event lighting was, as you can see, just incredible and superb. It truly created a wonderful party away from everyday concerns. 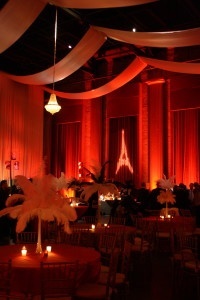 For a moment in time, all of the guests were transported to a luxe evening in the City of Lights. It was, thankfully, another wonderfully productive fundraising event and even surpassed last year in finds pledged to the charity. As a corporations, we have a personal interest in assisting with pediatric neuroblastoma research and we are always glad to be a sponsor of this event. In addition, it allows all of our creative lighting design talents to shine. once a year, the sky is the only limit in what we can create. We dare to dream big. When left to their own imagination, our team always turns out lighting design unseen elsewhere in gala and banquet events. 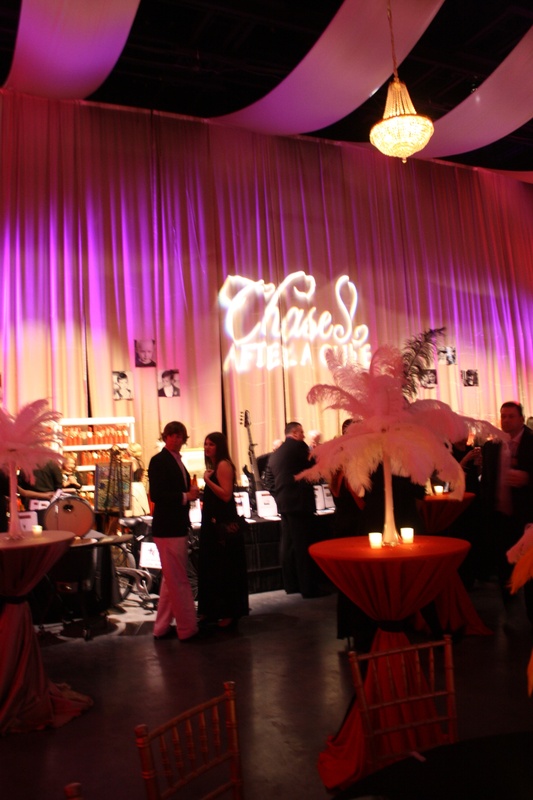 We are so proud of our Charleston teams and our North Carolina teams who joined them to make Chase After a Cure Gala incredible once again.